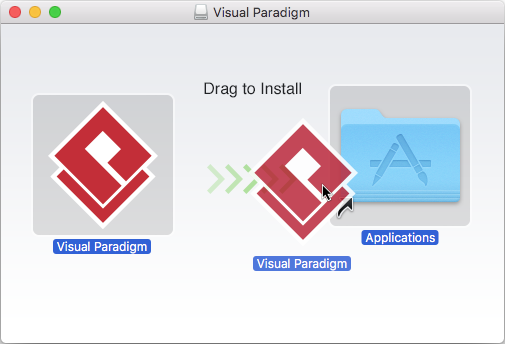 Once you have downloaded Visual Paradigm installer, execute it, run through the installation to install Visual Paradigm on your Mac. If you are using the InstallFree version, you just need to de-compress it and run Visual Paradigm directly. In this article, we will go through the installation of Visual Paradigm both with installer (.dmg) and InstallFree (.tgz). Double click on the downloaded installer file. Your installer file should have a filename that ends with _OSX_WithJRE.dmg. If not, it’s possible that the installer has no JRE bundled. You may want to download again or read the next section for the installation procedure of such an installer. Drag Visual Paradigm to the Applications folder, or anywhere else you want (e.g. Desktop). Wait for file copying finished. You can run Visual Paradigm by double clicking on it directly. 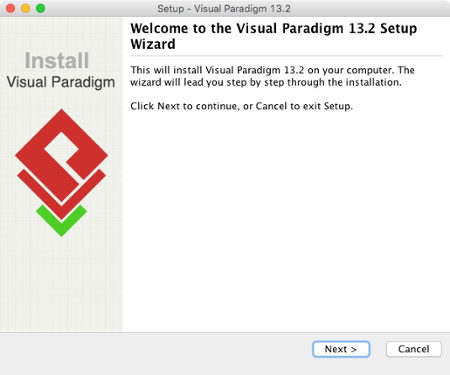 Execute the downloaded Visual Paradigm installer file. The setup wizard appears as below. In the File Association page, keep Visual Paradigm Project (*.vpp) checked if you want your system able to open the project file upon direct execution (i.e. double click). Click Next to start the file copying process. Decompress the downloaded .tgz file into a directory. This creates a subdirectory named “Visual Paradigm 15.1″ where 15.1 is the version number. That’s it. To start Visual Paradigm, execute Visual Paradigm 15.1\Visual Paradigm.app. Question: What is the difference between Installer and InstallFree Version? Answer: There are several possible causes of the problem. If you are sure that your installation was completed correctly, contact Visual Paradigm’s support team for assistance. Please include the vp.log file in ~/Library/Application Support/VisualParadigm (e.g. ~/Library/Application Support/VisualParadigm\vp.log) as well. Answer: Our installer files are all packed by ourselves in a secure environment and are scanned for virus before releasing to public. If a virus is detected, please update to the latest virus profile first. After that, we recommend you perform a full system scan, download the installer file from our official site, and run the installation again. If the problem remain, please contact us or the virus scanner vendor for assistance.